PSG countered Marseille’s 4-3-3 with their own similar formation that unlike for Marseille, has been a staple for PSG for quite a long time. 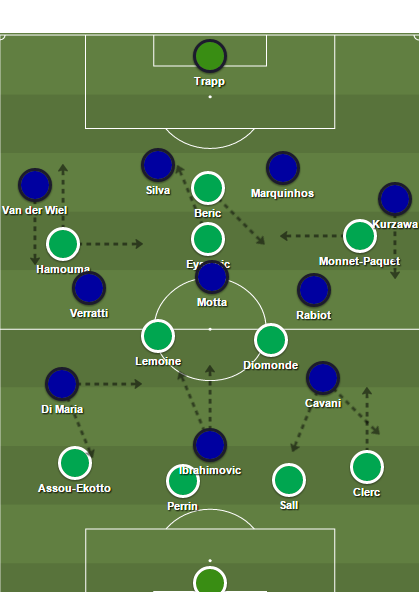 Le Classique was home to dueling 4-3-3s, a fascinating encounter between by far the best team in France, in PSG, and a mercurial Marseille club that have been much better than their 16th place showing. Under Marcelo Bielsa, Marseille were one of the most aggressive pressing sides in Europe last year. The intense man-marking system had its flaws (both short- and long-term), but it also had its considerable positive effects. Marseille were one of the best at establishing a chaotic tempo and getting out to early leads, very similar to the 2013-14 Liverpool side. The pressing system also suited certain members of last season’s Marseille squad. This year has been different. 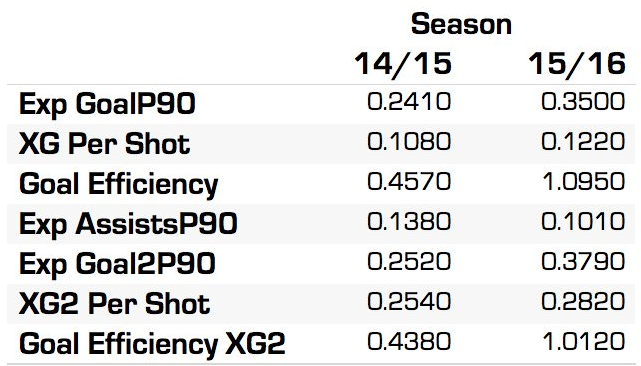 Marseille still press but not to the degree they did last season. Against PSG, it was more of the same. 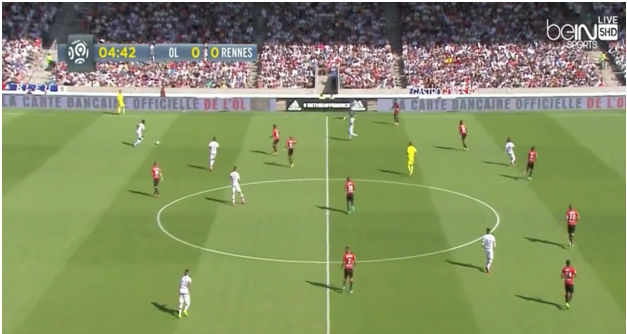 Marseille set up at times in a 4-4-2, very happy to allow PSG to pass from the back. It’s a considerable change from last season’s Marseille squad but it was also a welcome change in some ways. It displayed a sort of pragmatism that Marseille lacked at certain times last year. What made the new found conservatism even more profound is Marseille found ways to mix and match this with the intense man marking system. 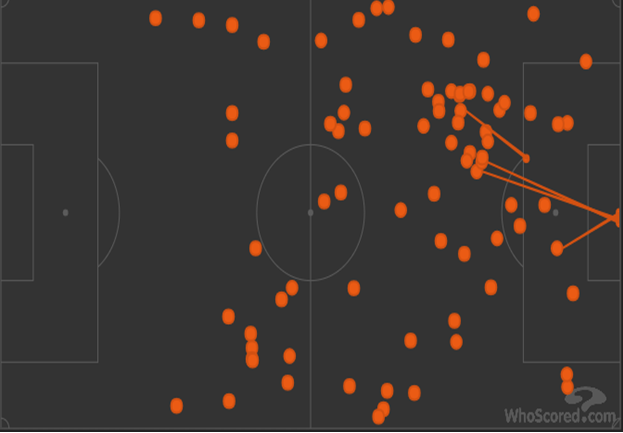 Even though Remy Cabella was listed as a LW, he drifted inside with and without the ball. Motta is dispossessed, which creates a counter attacking opportunity leading to a handball infraction just outside the penalty area. When Marseille got it right, PSG had stretches where they clearly struggled to create a passing tempo from the defense onto their attack. 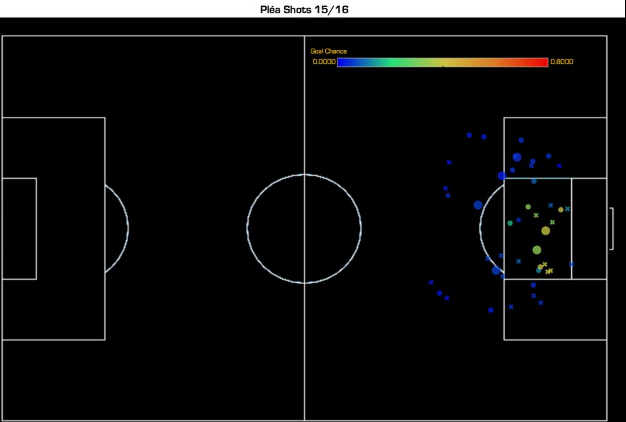 It showed more variety in Marseille’s off the ball structure than was present with Bielsa as their manager. 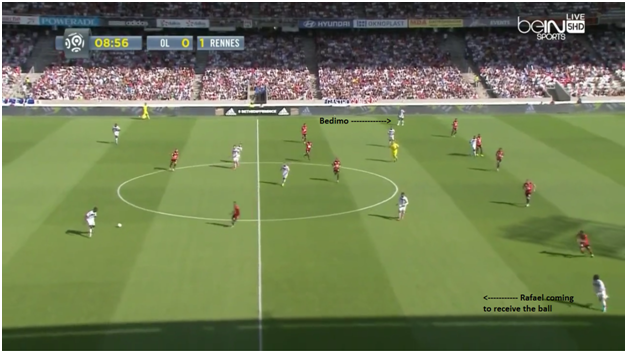 It also allowed for OM to soak up pressure and play on the counter primarily, something that they didn’t do much last season. 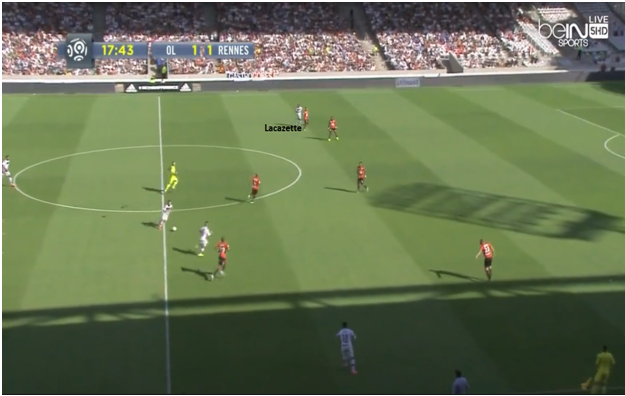 Roman Alessadrini took charge of the right hand side and was very direct while Michy Batshuayi presented himself as a credible target man when Marseille needed to play long balls to him to relive the pressure from PSG’s pressing of the OM backline. 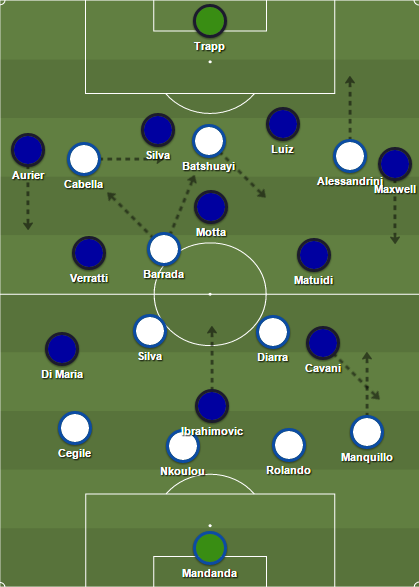 However there were consequences to the 4-4-2 set up that OM played defensively, and PSG exploited it when the opportunity presented itself, especially when Marseille became quite narrow. The use of Remy Cabella as a LW this season has come with mediocre results for Marseille and against PSG that didn’t change; though this time, Cabella was also a hindrance defensively. 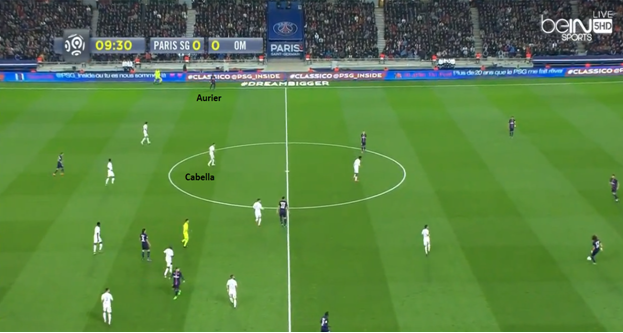 In the modified 4-4-2 system defensively, Cabella’s positioning was all over the place as he drifted inside many times. Sometimes he & Barrada would alternate who would play as the nominal left sided midfielder in defensive phases. Occasionally it ended in good results, like the instances where Marseille would try and create transition opportunities. 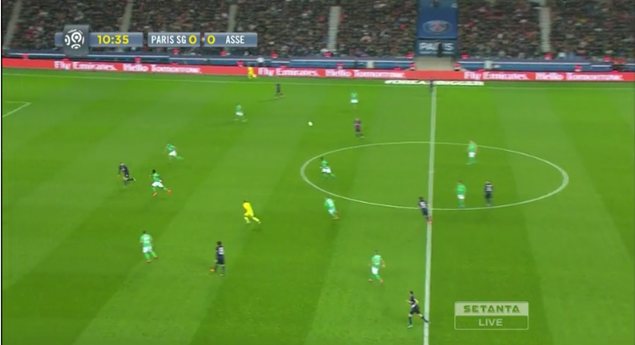 Other times, it left acres of space for PSG to punish when given the opportunity. Serge Aurier is perhaps the most forward-venturing fullback in Ligue 1 and he was a constant nuisance for Marseille with his positioning, putting a huge strain on Paulo De Cegile and the OM backline to cover up. This was a constant theme for Aurier. What made this particularly tough was that Di Maria and Aurier would often times alternate positions. Di Maria would come deeper despite being the RW and Aurier would go forward. Combine that with the brilliant movement of Marco Verratti and It resulted in PSG’s first big chance of the match. 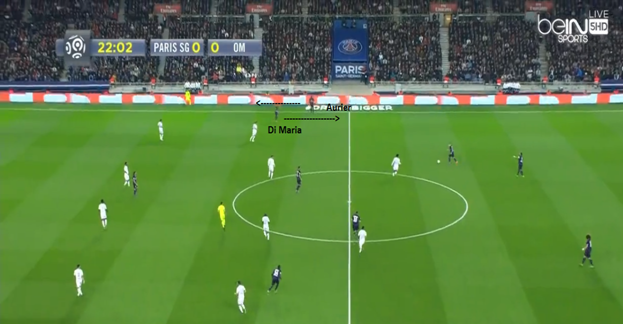 The constant switching between Di Maria and Aurier was a powerful weapon for PSG, and it also displayed the damage Di Maria could inflict from deeper areas. Aurier when going forward is very comfortable on the ball and it proved too much for Marseille to handle. 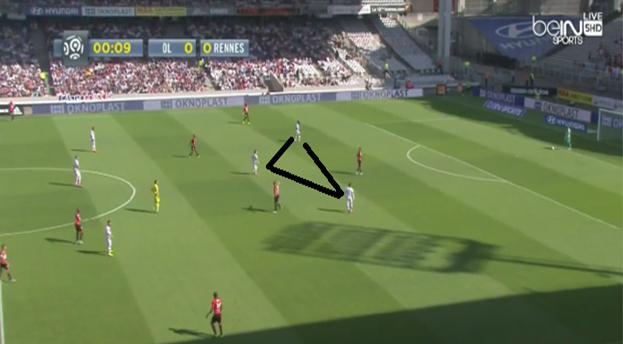 De Cegile isn’t lacking mobility but there was no chance he could cover the entire right hand side by himself, as Cabella was slow to shift. No LB in the world could, nor should, be faced with 1v2’s against the likes of Di Maria and Aurier. 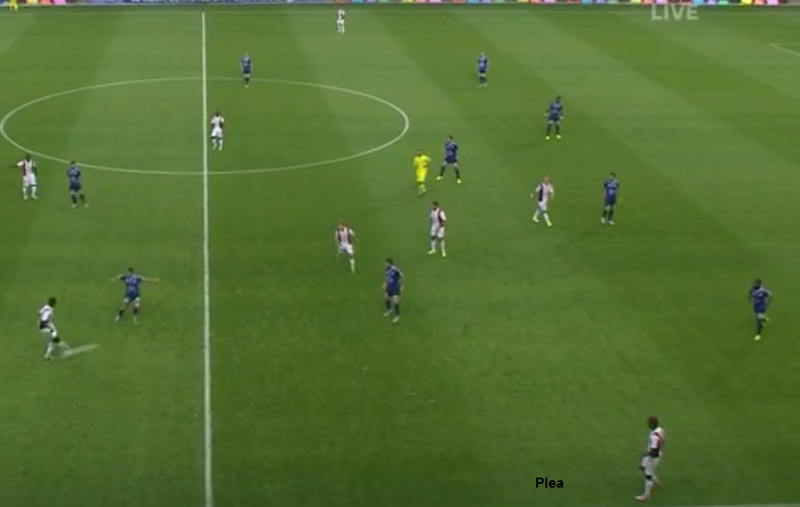 Marseille had no counter to this whilst both Cabella and Barrada were on the pitch and it brings into question why Michel is continually playing both Barrada and Cabella on the left side. It was a masterclass showing from one of the best RBs in Europe. Aurier wasn’t flawless (he gave up a penalty that could’ve equalized for OM in the 2nd half) but his overall performance displayed both the endless stamina and skillful talent he possesses. With Michel setting up Marseille to play primarily on the counter attack versus PSG, Batshuayi was tasked to play multiple different roles. At times he was asked to play as a point of reference of some sorts, other times he tried to give width to compensate for Cabella’s continued escapades into the central area. There were even multiple occasions where Batshuayi would collect the ball from inside his own half, another sign into both how committed Marseille were to playing on the counter and how big a stranglehold PSG had in terms of raw possession. 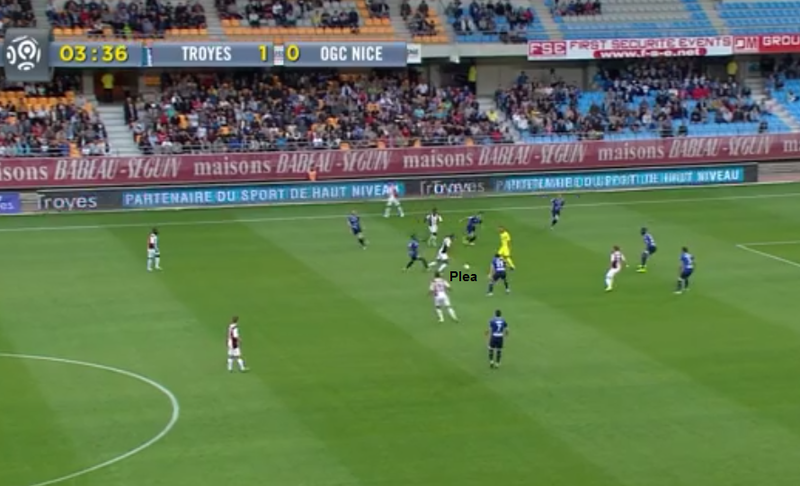 When Marseille wanted Batshuayi to run through the channels, he had the mobility to do so. Against a lesser type of opponent, these kind of instances could’ve resulted in breakaway caliber of chances. 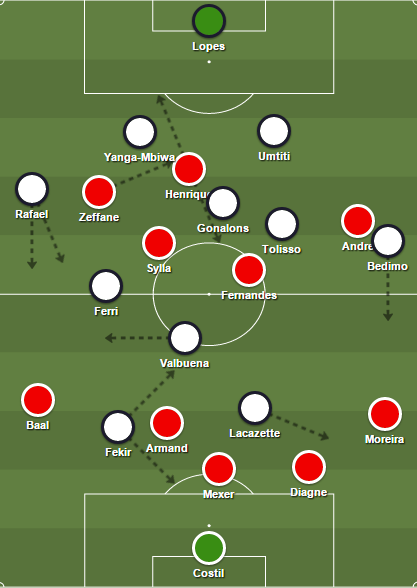 It didn’t against PSG because they have the type of mobility at CB to sniff it out and turn possible quality chances into run of the mill stuff. The goal by Marseille though exemplified the all -around capabilities that Batshuayi possesses. He collected the ball around midfield to keep hold of possession for the team. And then made a typical center forward run and got on the head of Barrada’s cross. There were also moments where Batshuayi would try and create offense for himself, one of those instances occurring two minutes after the 55th minute penalty save from Kevin Trapp, resulting in a half chance that was parried away. Performances like this are a strong indicator into the caliber of player Michy Batshuayi could become. Against lesser opponents, Marseille’s half chances could’ve been B+ caliber of chances, and most of Marseille’s chances have Michy Batshuayi’s fingerprints all over them. The performance produced by Marseille was a indicator that they are certainly not the caliber of a 16th place team, which is also backed up by the data. It wasn’t a perfect performance, as PSG did create three clear cut chances from open play, but that’s usually a given when PSG play anyone in Ligue 1. PSG at times looked genuinely troubled with Marseille’s change of pace defensively and were hit on the counter multiple times including the opening goal. Bordeaux did similar things against PSG earlier in the season and it’s the clear tactic to use against a possession dominant side like PSG. But it was also a reminder as to the massive gap between PSG and the rest of the field in Ligue 1. 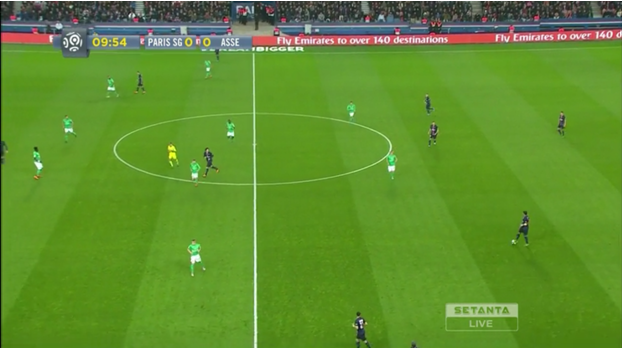 On an off day, PSG were still able to get in behind Marseille’s defense. 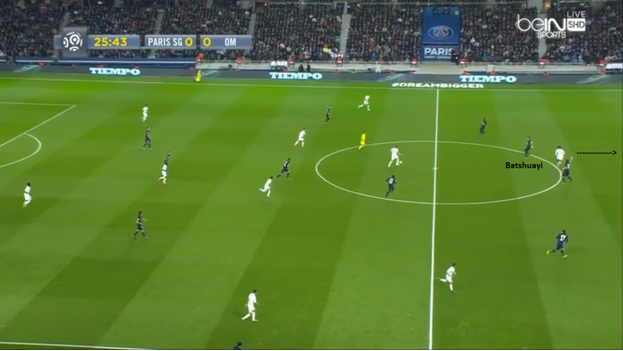 In a battle of 4-3-3s, PSG’s version looked more compact defensively even with Marseille doing a number of things right. The use of Remy Cabella at times effectively gifted PSG the right hand side and both Di Maria and Serge Aurier took great advantage of it. It looks increasingly unlikely that Marseille’s best lineup shouldn’t include both Barrada and Cabella, and it’ll be up to Michel to play a traditional winger if he wants to keep his version of the 4-3-3. There are clear signs that Marseille will right the ship and move up the table. The problem is just how quickly can they climb up and salvage a possible shot at a Champions League birth for next season.